Bibliography: Bartsch 44; Hind 120; White and Boon third of three states. For student research on the DAC’s Rembrandt holdings’ watermarks vis-à-vis Nancy Ash and Shelley Fletcher’s concordance Watermarks in Rembrandt’s Prints (Washington, DC: National Gallery of Art, 1998), see object file Rembrandt Watermarks 2000. 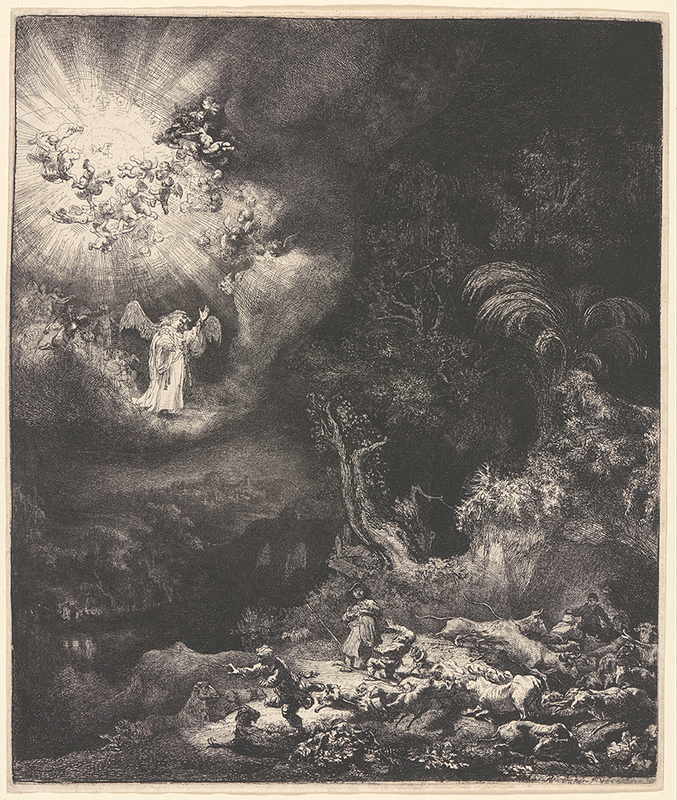 The Angel Appearing to the Shepherds, . Etching, engraving, and drypoint on laid paper. Third of three states. Plate: 260 x 217 mm (10.2 x 8.5 in.). Sheet: 264 x 220 mm (10.4 x 8.7 in.). DAC accession number 1938.D1.48. Gift of George W. Davison (B.A. Wesleyan 1892), 1938. Open Access Image from the Davison Art Center, Wesleyan University (photo: R. Lee). http://dac-collection.wesleyan.edu/obj11991 is a persistent link to this page with no user-session information.